Washington-area transit advocates today called on the legislature to raise the gasoline tax to build the Purple Line and Baltimore Red Line and expand the state’s MARC rail system. Just received this update from Act and wanted to pass it along. What do you think — is the Purple line a good idea? In this morning’s Washington Post Robert Ehrlich’s campaign for Governor made the bombshell admission that the Maryland state budget does have enough money to build the key segment of the light rail Purple Line between Bethesda and Silver Spring. 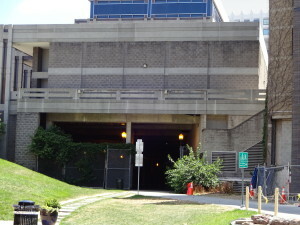 The Post reported that “Ehrlich aides said stopping the Purple Line and a proposed rail project in Baltimore could save the state $300 million in engineering costs that could be spent instead on local road projects.” The $300 million that the Ehrlich campaign wants to take out of the transit budget is equal to the cost of building light rail from Bethesda to Silver Spring, along the old railroad line that passes through Columbia Country Club. This will be the busiest and fastest segment of the Purple Line, and was originally proposed in 1986 as stand-alone project. Subsequent studies have consistently demonstrated that this light rail segment by itself would have great value. ACT has summarized the records on the Purple Line of both Mr. Ehrlich and Governor O’Malley at a new website, www.PurpleLine2010.com . With the Purple Line already a defining issue in the race for governor of Maryland, the planned light rail line is moving further into the spotlight with a new website, PurpleLine2010.com, that highlights the candidates’ records on that issue. The website was compiled by the Action Committee for Transit, a citizen advocacy group that is independent of the candidates for office. The signs will be displayed from 7:00 to 9:00 am at exits on the Beltway between Bethesda and New Carrollton. The new rail line will run parallel to this highly congested section of the highway, offering commuters a way to avoid the traffic jams. “With the Purple Line such an important issue in this election, voters need a way to get past the fluff and learn the facts,” commented Ralph Bennett, president of Purple Line Now, a coalition of citizen, environmental, labor, and business groups. “We do this because we believe that an informed voter is the bedrock of the American system,” added Ben Ross, president of the Action Committee for Transit. ACT has published scorecards showing candidate positions on the Purple Line and other transit issues in every state election since 1998. Just to build on Raj’s post a couple of days ago, Gov. 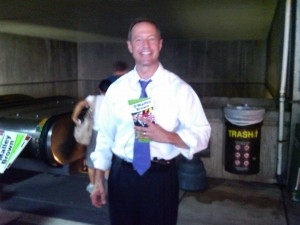 Martin O’Malley has actively promoted the Purple Line light rail in his bid for re-election. The Purple Line is a 16-mile project that would connect Bethesda to New Carrollton via Silver Spring at a cost of almost $1.7 billion. Full article here. Candidate responses to the Action Committee for Transit’s have been posted on the web. The full text of all responses can be read here. The answers show that political support for transit is increasing rapidly, reflecting the strong public sentiment demonstrated in last April’s Washington Post poll. ACT president Ben Ross pointed in particular to the overwhelming support for the planned light rail Purple Line and the growing majority of legislators who favor studying ACT’s transit alternative to widening I-270. What do you think light rail or rapid bus for the purple line?